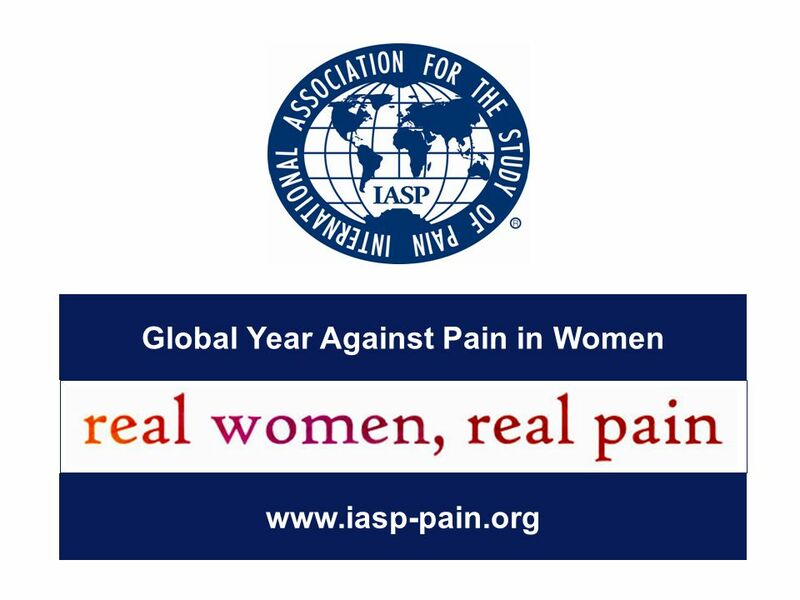 Global Year Against Pain in Women www.iasp-pain.org. 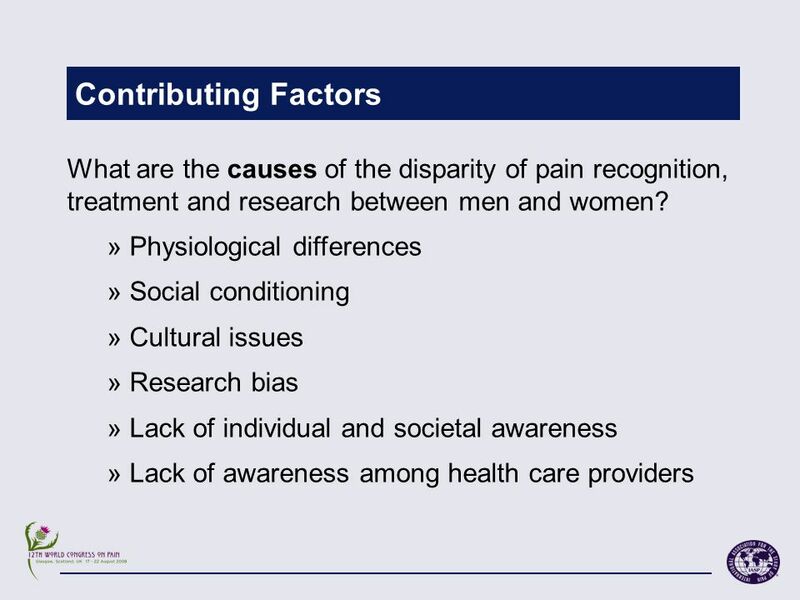 2 Introduction IASP and its members are committed to raising global awareness of the disparity of pain recognition, treatment and research between men and women. 3 Why Real Women, Real Pain? 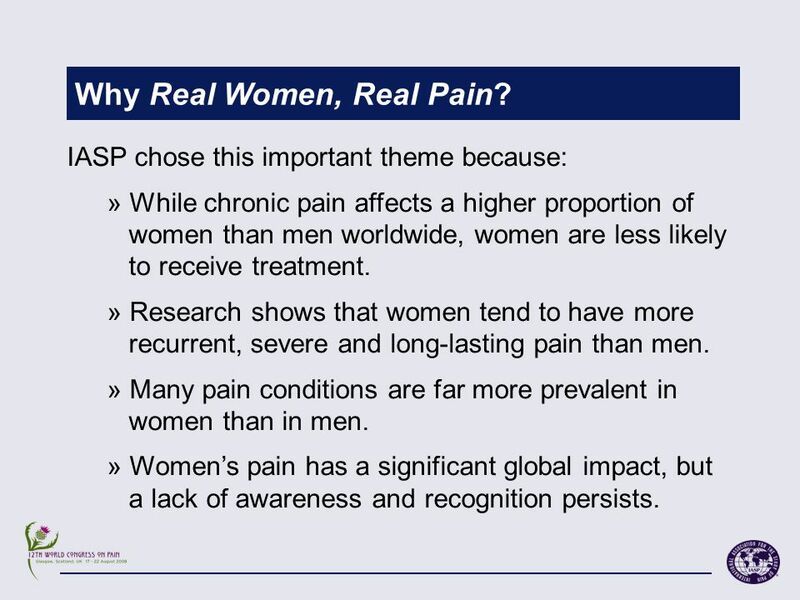 IASP chose this important theme because: » While chronic pain affects a higher proportion of women than men worldwide, women are less likely to receive treatment. » Research shows that women tend to have more recurrent, severe and long-lasting pain than men. 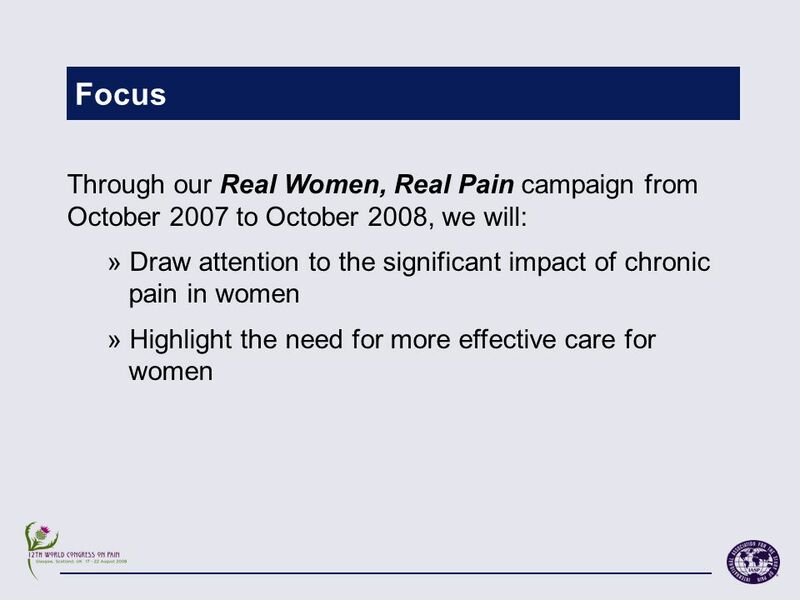 » Many pain conditions are far more prevalent in women than in men. » Women’s pain has a significant global impact, but a lack of awareness and recognition persists. 8 Special Issue of PAIN View the Table of Contents or access this special edition via ScienceDirect by visiting www.iasp-pain.org/pain. 10 Events and More Information Please join us in drawing attention to this vital issue! » Many events focusing on women’s pain are scheduled across the globe in the coming months. 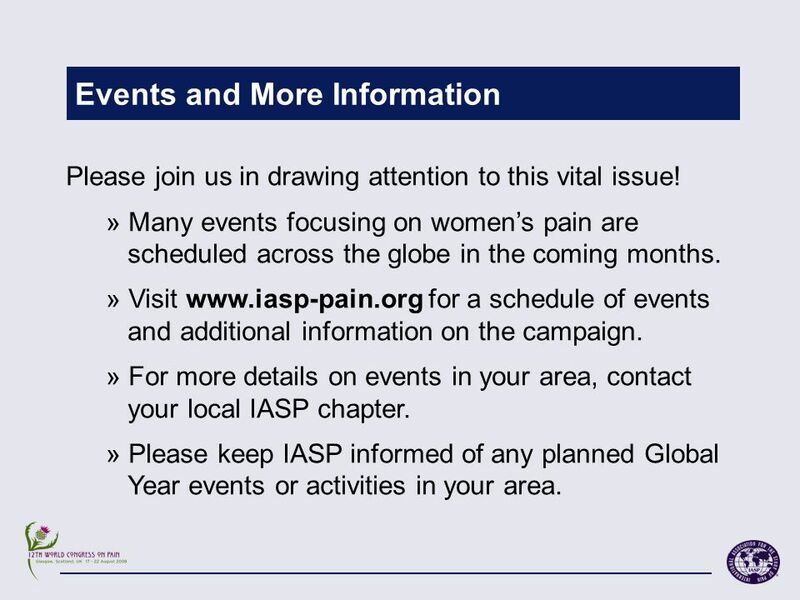 » Visit www.iasp-pain.org for a schedule of events and additional information on the campaign. » For more details on events in your area, contact your local IASP chapter. » Please keep IASP informed of any planned Global Year events or activities in your area. 11 About IASP IASP brings together scientists, clinicians, health care providers and policymakers to stimulate and support the study of pain, and to translate that knowledge into improved pain relief worldwide. Founded in 1973, IASP has more than 6,300 members from 108 countries and 69 local chapters. 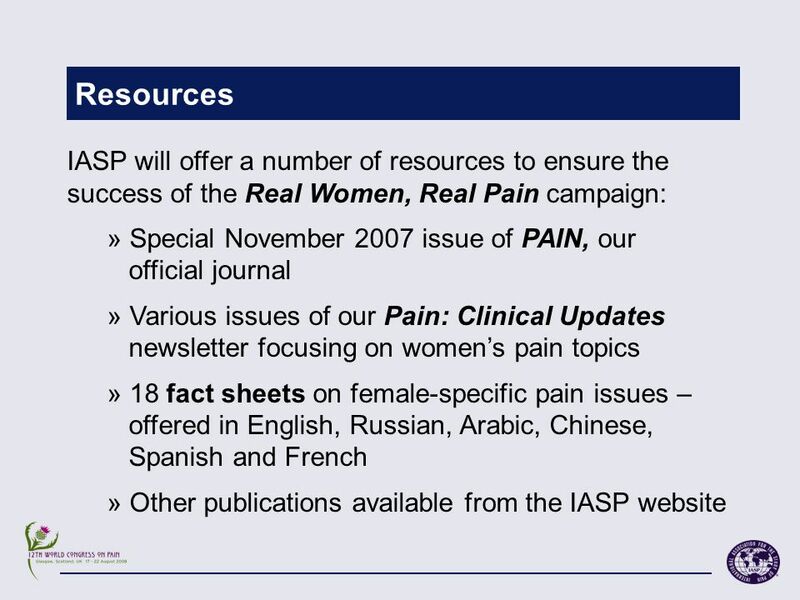 Visit www.iasp-pain.org for more information. 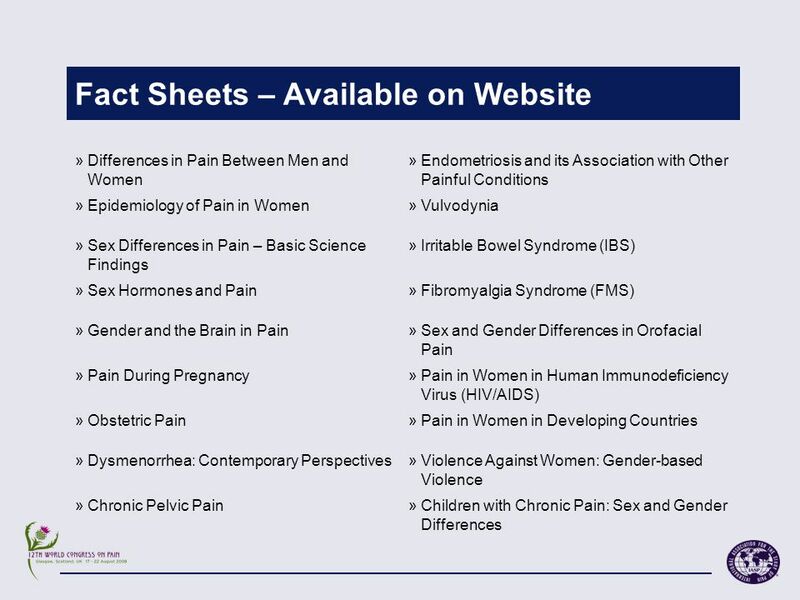 Download ppt "Global Year Against Pain in Women www.iasp-pain.org." LEVELING THE PLAYING FIELD: GENDER ISSUES AFFECTING STUDENTS Barbara A. Horwitz Distinguished Professor of Physiology Vice Provost – Academic Personnel. Good Practices in Library Programming Section B March 14, 2012. © 2006 Prentice Hall Leadership in Organizations 14-1 Chapter 14 Ethical Leadership and Diversity. An Overview of the European Policy Framework on Gender Equality Gender Agenda – Women, Men, Age and Employment in the Performing Arts. Gendered Assumptions and HIV/AIDS in Armed Conflict and Humanitarian Emergencies Presenter: Henia Dakkak Date: 23/07/2014. 《 Promotion of Capability and Effectiveness for Tobacco Control Program among Rural Residents* 》 --Report On The Baseline Survey (Tobacco use status among. Internal Stigma among HIV- positive adults in Ethiopia ETHIOPIAN STIGMA AND DISCRIMINATION SURVEY-KEY FINDINGS Tsegazeab Bezabih. GAP Report 2014 People left behind: Adolescent girls and young women Link with the pdf, Adolescent girls and young women. Youth Advocate Program International nd St. NW, Suite 209 Washington DC 20016, USA Children Infected & Affected by HIV/ AIDS. Social Work Students Program Learning Outcomes Learning Outcomes:  Introduce knowledge about prevalence, dynamics and impact of family violence in contemporary. A generation of children free from AIDS is not impossible Children and AIDS Fourth Stocktaking Report, 2009. Global Awareness Program Women’s Health. What sets women’s health apart from men’s? Two big themes: 1)Women generally need more health care than men because. HPV & Cervical Cancer Frequently Asked Questions HPV & Cervical Cancer Prevention 2009 International Toolkit. From, with and for young people 3rd European Youth Forum for Road Safety 1 & 2 July 2010 Brussels.